Teaching may not always be an exact science, but often what children learn is more exact than what we have taught. Let me explain. Suppose I want to teach children about legato using movement. Legato is a term used in both music and dance, so it is especially fitting that I use both to teach the concept. I begin by having my student imitate my motions, as I move smoothly and continuously. Most of us will naturally move slowly as we do this to bring out the smoothness and connectedness of our movements. There is the first pitfall. Legato is not a word that refers to tempo, but to articulation. It is important that we change the tempo of our motions so that the children do not learn that legato means slow. It means connected and smooth at any tempo. So I have them imitate fast legato, slow legato, and medium legato. I might say, “all of my motions do not have the same tempo, but all are called legato. What makes them legato? The smoothness and connectedness makes them legato. I can do legato fast, or I can do legato slow, or I can do legato in between. It’s all legato just the same. Another example is found in a method for teaching whole notes. Having children toss balloons or scarfs into the air and then catching them after four beats is how these are sometimes taught. This method provides a clear visual representation of sustained movement over four beats, and is readily transferable to sustaining sound as movement through singing or the playing of a musical instrument. A child can see the object floating in the air for a time-span of four beats, and then land in her hand to complete the note. The pitfall is that because the object is doing all the work between the release (attack) and release (capture), the child does not experience the effort needed to sustain a musical pitch, and may erroneously learn that sustaining whole notes is effortless. Instead of tossing the balloon, a child can blow it into the air, and continue to blow on it for four beats. When they stop blowing on it, the balloon comes down into their hand, ready to be made air bound again at the next exertion of blowing. They can even blow on their own hand as they raise and keep it above them for four beats, and then stop blowing as they lower their hand. This retains the floating of an object (balloon or hand) for four beats, but also adds the act of breathing that is essential to sustaining a musical tone. 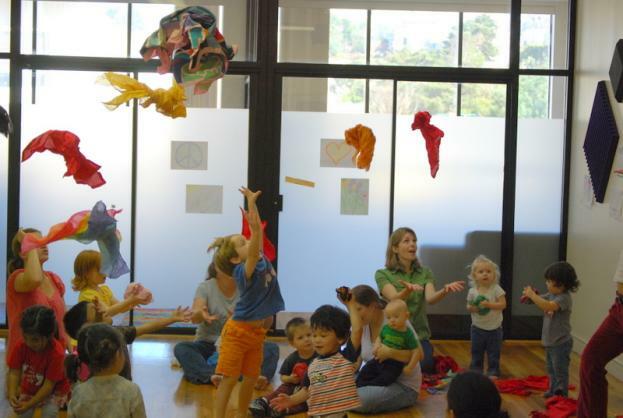 Parents and their children toss colorful scarves into the air at one of Charity Kahn’s dance and music classes. The observant reader has also noticed the potentially confusing contradiction in terms. The start of a note is referred to as an attack, but the start of the balloon whole note can be initiated by a motion of releasing it, the term in music used for ending, not initiating a note. The teacher must be specific about he motion used to make the balloon air born, making the motion one that exerts a force on the object, setting it in motion. It is this setting in motion by pushing or “attacking” the balloon that must be the focus, and not the letting go of the balloon as it begins its flight. 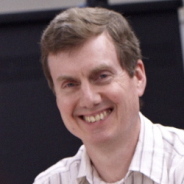 Because the body is involved in producing musical sound, non-musical movement that we use to teach musical concepts must be carefully connected to the musical behavior for which we intend to prepare students. For this reason, it is sometimes useful to work in both directions. Beginning with the music and then moving to it causes students to interpret the music with movement. Beginning with the movement and then singing or playing a musical instrument to it causes students to interpret the movement with music. By doing it both ways, a clearer connection is made between music and movement. This clarity then helps gives movement a musical context, and music a movement context. Students will sometimes prefer or be better at one direction than the other. By including both, they are able to practice their strength and strengthen their weakness. Because of how holding and playing instruments naturally restricts movement and access to space to move in, instrumental directors may want to practice movement and music without instruments as a warm-up activity, having students sing their instrument parts while moving to them. It is eye-opening to see the different parts, melody, harmony, and counterpoint, moving each according to its function in the music. Marching bands can, of course, do interpretive movement as they play, in addition to (if they are different) their assigned steps. Choirs have an easier time moving about a room while singing, and should take full advantage of this frequently in rehearsals. Interpretive movement can also develop into performance-worthy choreography that helps communicate the singers’ interpretation to an audience, and adds visual interest and variety to concerts. In short, there is everything to be gained, and little if anything to be forfeited by incorporating movement into all varieties of music making.